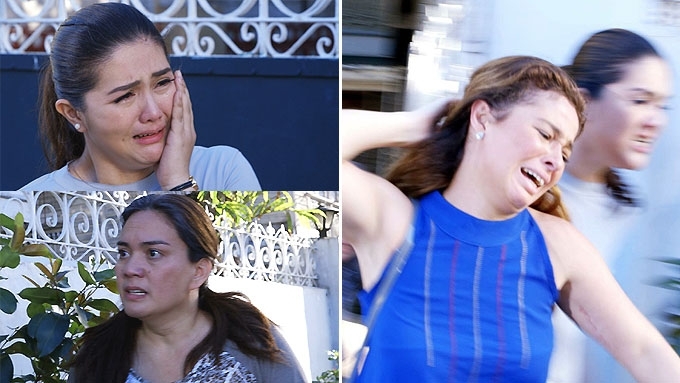 Remember this scene when Amanda (Dimples Romana) dragged Lizelle (Andi Eigenmann) out of the Alegre house and Gloria (Sylvia) gave Amanda a hard slap? Here are 10 intense confrontation scenes from The Greatest Love. ABS-CBN's afternoon drama The Greatest Love depicted the great love of a mother for her children, even though her Alzheimer's Disease puts her in a difficult position. Gloria (Sylvia Sanchez) struggled as her children Amanda (Dimples Romana), Andrei (Matt Evans), Paeng (Arron Villaflor), and Lizelle (Andi Eigenmann) slowly drifted apart and focused on their individual lives. The members of the Allegre family were put to the test as secrets from the past haunted their present lives. At 59, Gloria was able to find and rekindle true love—in the person of Peter (Nonie Buencamino)—as she slowly deteriorated because of her illness. The Greatest Love was also talked about for its trending confrontation scenes. As the series approaches its finale this April 21, PEP.ph (Philippine Entertainment Portal) looks back at 10 of the most intense confrontation scenes of The Greatest Love. 1. The First Big Alegre Fight. Who would have thought that a supposedly happy celebration for Lizelle's upcoming wedding would turn into a big fight? Lizelle's supposed mother-in-law Lisa (Maila Gumila) insulted the Alegre family, and Lizelle revealed to everyone about her illegitimacy. This did not sit well with Amanda, especially since she cannot accept that Gloria had an affair with another man. The confrontation branched out into different issues and arguments led to Andrei and Paeng punching each other's faces. Gloria stopped them and told her children, "Hindi kayo ganyan dati mga anak! Hindi kayo ganyan dati!" Amanda then responded, "Just face it, Ma! Just face it. Hindi na babalik ang pamilya mo sa dati. Ilusyon mo na lang yon!" 2. 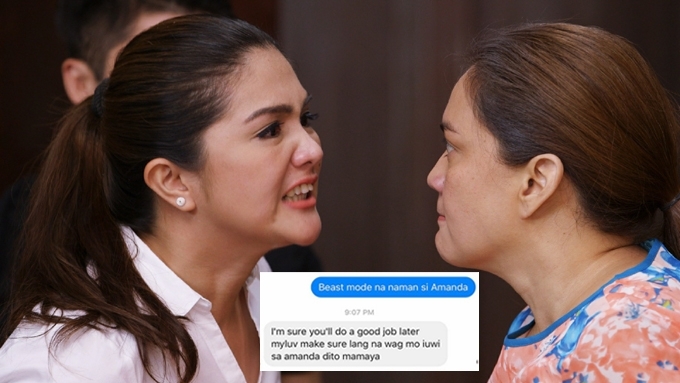 Amanda to Gloria: Hindi kita kailangan! After the big fight, Amanda was surprised to see Gloria inside their house. Amanda told Gloria how Lizelle's revelation affected her and almost caused her to lose her job. Gloria tried to appease Amanda and promised her that she will fix the mess. However, Amanda just asked one favor: "Just stay away from me!" The angry daughter stressed, "Hindi kita kailangan!" 3. "You really deserve the award!" During the awarding ceremony where Gloria got the Ulirang Ina award in San Ildefonso, Peter discovered that Lizelle is indeed his daughter and went straight to the venue. Estella (Tetchie Agbayani), Gloria's cousin-in-law, caught Gloria having a sweet time with her illegitimate family. This made Amanda, Andrei, and Paeng furious and they expressed their anger for their mother. Amanda sarcastically told Gloria, "You really deserve the award!" Her three children then walked out. After Amanda presented a commercial pitch to Lizelle's company, the two had a heated confrontation. This happened when Lizelle tried to tell Amanda that she should have not relied on Paeng's services, which delayed the presentation. Their arguments became way too personal and Amanda tried to slap Lizelle. However, the younger daughter of Gloria stopped her. Lizelle then told Amanda, "Wala kang karapatang saktan ako sa opisina ko. Pwede kitang ipakaladkad palabas!" 5. Gloria slaps Amanda after dragging Lizelle out of their house. Amanda paid a surprise visit to Gloria's house when she heard and misinterpreted Lizelle advising her mother to transfer to Peter's house. Amanda slapped Lizelle and dragged her out of the Alegre household. Gloria tried to stop them but Amanda pushed her. The furious Amanda told Lizelle, "Lumayas ka! Hindi ka nababagay dito dahil hindi ka naman Alegre!" Shocked by what her eldest daughter did, Gloria slapped Amanda after telling her, "Hindi mo na ako ginalang at wala ka nang awa sa kapatid mo!" 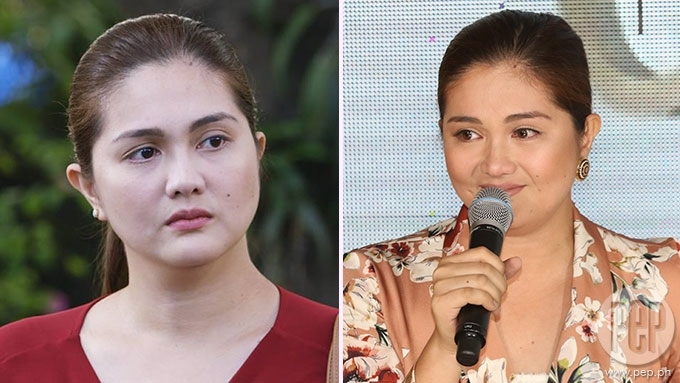 During the April 2 finale presscon of TGL, Dimples and Andi said that they didn't have a hard time shooting their hair-pulling scene, since Dimples also played kontrabida to Andi in the latter's first teleserye Agua Bendita. Dimples admitted, "Sanay siya sa sabunot ko. Hindi naman masakit yung sabunot ko, ako pa nga ang nasaktan! Buhol buhol kasi yung hair niya so na-hurt yung hand ko! Sa totoo lang, sa artista, kahit na matatakutin ka sa eksena, kung mahusay ang ka-eksena mo, ma-e-excite ka, e."
6. The difficulty of being an Alegre. The Alegre siblings had a physical fight after Lizelle and Andrei found out that Paeng put a mortgage on their house. An oblivious Amanda was dumbfounded by this act and she brought up past issues involving the siblings. Gloria then arrived at her house witnessing her children fight. To stop them from fighting, Gloria threw a flower vase and flipped over a table. She reprimanded her children, "Nakakapagod makita na lang kayo palagi na nag-aaway, nakakapagod!" Amanda agreed and said spitefully, "Tama ka, Ma! Nakakapagod! Nakakapagod maging parte ng pamilya mo!" During the presscon, Dimples revealed how they prepare for a big scene: "Kami po, bago mag-eksena, naglalaro po muna kami. Actually, pinaka malaro si Andi. Naglalaro po kaming lahat, si Andi kumakain ng props. "So yun po ang nangyayari bago ang isang mabigat na eksena, because we also don’t want to feel the weight so much, kasi lahat kami nininerbiyos gawin, e."
7. Amanda asks Gloria: Akala ko ba mamamatay ka na? Gloria's urgent text message prompted her children to rush to her house on her birthday. Amanda was the last to arrive, and was shocked to see Gloria and her three other siblings having fun at the dining table. Amanda pointedly asked her mother: "Ano 'to? Akala ko ba mamamatay ka na?" When Gloria was about to tell her children about her condition, a heated argument ensued again between the two. This agitated Gloria's Alzheimer's Disease and she ended up forgetting the identities of her children. The children (except Paeng who knew about her condition) was shocked when Gloria asked them, "Sino kayo? Bakit kayo nag-aaway-away sa bahay ko? It was then revealed to the Alegre siblings that Gloria has Alzheimer's Disease. It can be recalled that this dining table scene was seen during The Greatest Love's first teaser that received mixed reactions from viewers. A Visayan filmmaker accused The Greatest Love of copying a scene from his film. 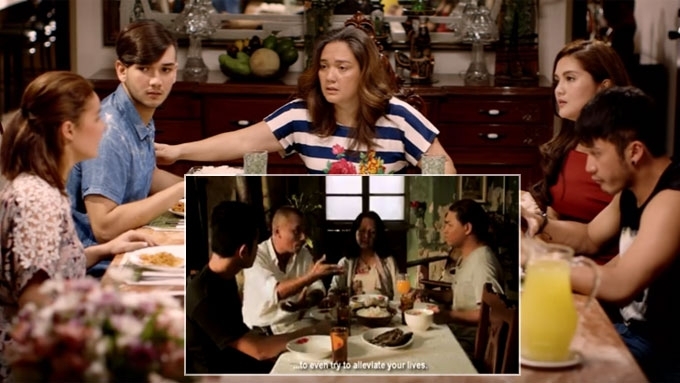 In response, creative consultant Ricky Lee pointed out that a dining table scene in any family drama is normal, since it happens to real families. 8. The argument that caused the fire. The siblings had a disagreement again when Amanda found out about Peter and Gloria's upcoming wedding without Lizelle and Andrei talking to her. A simple disagreement turned into a huge fight when the secret came out that it was Amanda who talked to Peter to not push through with the wedding. Gloria accidentally witnessed the argument. This surprised her since she thought that all is well among her children. The incident agitated Gloria's Alzheimer's Disease and she forgot that she was cooking. This led to a fire that destroyed their house. 9. Gloria loses control of her bowel movement. While fitting her gown, Gloria accidentally revealed to Amanda that she almost had an abortion. Dumbfounded, Amanda stepped out and locked herself inside her own room to cry. Amanda then heard Gloria calling for her since the latter needed to go to the bathroom. Unfortunately, Gloria lost control of her bowel movement and she pooped in her own pants. When Amanda entered the bathroom, she saw that Gloria's poo was scattered around the whole area. Feeling irritated, Amanda tried to keep calm but Gloria wouldn't let her touch her. The stubborn Gloria accidentally put poop on Amanda's face as she tried to avoid her caregiver. Still reeling from what she discovered about her past, Amanda got mad at Gloria and told her, "Ma, sobra sobra ka naman!" 10. Amanda finds out that Gloria was raped. All the while, Amanda thought that Gloria tried to abort her because of her mother's love for Peter and that she was forced to keep the baby. 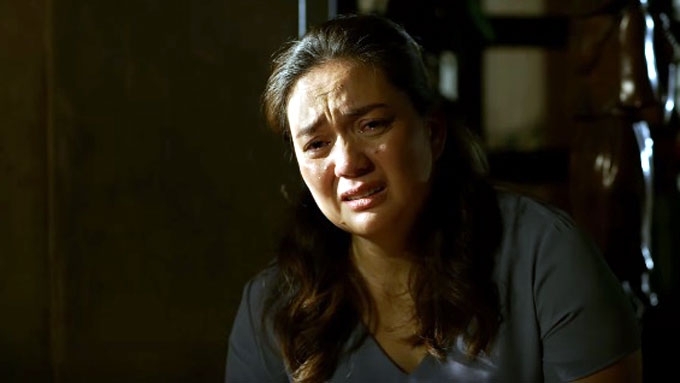 Initially, Amanda did not believe that Gloria was raped by her father Andres (Junjun Quintana), until Gloria told her everything, detail by detail. Gloria then said, "Hindi ko mahal si Andres, pero yung bata sa sinapupunan ko, anak ko yun, mahal ko yun. Magsasakripisyo ang nanay para sa mga anak." Amanda shed tears as she realized her grave mistake. The daughter decided to leave her family out of humiliation for everything that she did to her mother. During the April 20 episode of The Greatest Love, Gloria had a peaceful death after years of battling Alzheimer's Disease. In the finale episode, viewers will see what happens to Gloria's children after her death. PEPsters, what are your favorite scenes from The Greatest Love?